All reluctant hitwoman Maggie Lee really wants is to have a calm, normal life. She doesn’t want to go around killing people for money. She doesn’t want her sister to be terrified of her ex-pimp. She doesn’t want her Dad to disappear from the Witness Protection program. But Maggie rarely gets what she wants. But will Maggie end up being the one who needs to be saved? The hit woman and the 7 cops. This is far the best book of the Confessions of a Slightly Neurotic Hitwiman. I love a story that can make me laugh out loud. Poor Maggie has such a screwed up family but delightful and feel like you're right there with her. Such a good read. Oh how I missed this series! It has been awhile since I picked up a Hitwoman book and when I did it was like coming home. Tagging along with Maggie while she gets caught up in all sorts of unbelievable situations is such an adventure. JB Lynn has such a gift for entertaining through her stories. The Hitwoman and the 7 Cops is another unique installment in this series. In the 7 Cops, Maggie suddenly has too many law enforcement officials hanging around while she is busy taking care of everyone else's problems. Missing during a lot of the scenes is my favorite character, Patrick, but the end of the book explains this. There in Patrick's place is Zeke, who I like, but don't want Maggie to get too close to. That was a little twist in the book. Lucky for Maggie, though, she always has plenty of people offering her advice including Godzilla. The snarky little anole is always one I enjoy hanging out with. Somehow Maggie manages to hold it all together, spend some quality time with her mother and father and solve everyone else's problems. I have so many emotions when I read these books. I love how Maggie wants to help everyone but feel bad for her because her family isn't always nice to her. Sometimes I want to take Maggie away from them all but I can see that they all love each other. They are just a nutty bunch. Lynn ends the book with quite a surprise and caused me to go directly to my online retailer of choice to download the next in the series. I couldn't walk away from the book like that! 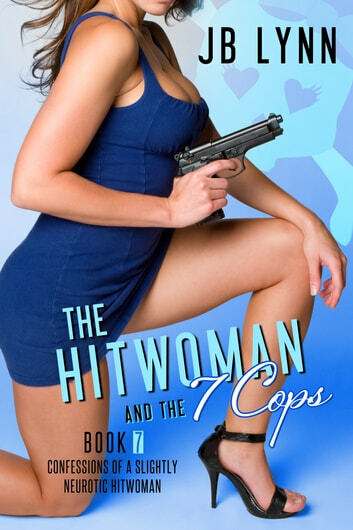 If you are looking for a book with lovable characters, a unique plot and laugh out loud moments, give The Hitwoman and the 7 Cops a read!